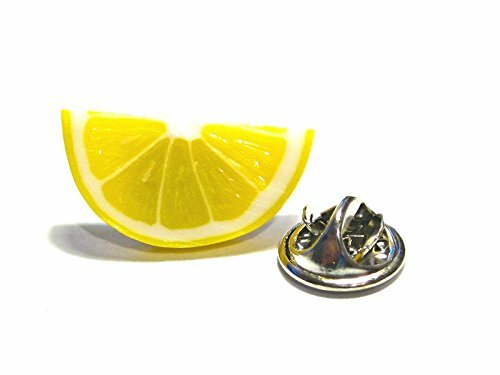 Lemon Pin - Tiny Food Jewelry by Tiny Food Shop at Nicky's Blog. Hurry! Limited time offer. Offer valid only while supplies last. A sunny little lemon slice pin straight from the tree to your tie, sweater, lapel, hats, bags, scarves and anything other fabrics in need of fruit. A sunny little lemon slice pin straight from the tree to your tie, sweater, lapel, hats, bags, scarves and anything other fabrics in need of fruit. Each of the pins are secured to steel pin backs. The lemon wedge is made from polymer clay. Size / Measurements: The fruit pin measures about 0.85" wide by 0.45" high. The tie tacks are 9 mm long. If you have any questions about this product by Tiny Food Shop, contact us by completing and submitting the form below. If you are looking for a specif part number, please include it with your message.